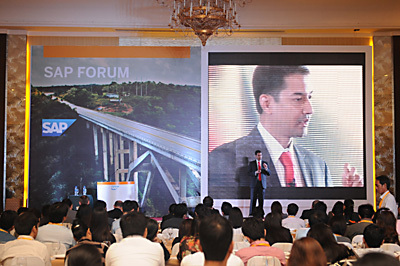 SAP Philippines is a wholly-owned subsidiary of SAP AG, a company based in Germany which has been around for 40 years. The mother company of SAP Philippines is the top provider of applications and services making companies become well-run businesses. This is true for all sizes of companies in at least 26 different industries. SAP Philippines was born in 1995, joining the ranks of other Asia Pacific offices in Australian, China, Hong Kong, India, Indonesia, Japan, Korea, Malaysia, New Zealand, Singapore, Taiwan and Thailand. And for the past 18 years, SAP Philippines has enabled local companies to improve the way they do business. Foremost among SAP Philippines’ objectives is to take care of the complex business operations transactions so that decision makers of the company can channel their time, energy and resources to growing their business and staying competitive. SAP Philippines’ most popular product appears to be its enterprise resource planning software, SAP Business One. It is a holistic solution that a company uses from the beginning until the end of its business processes, so that most of the focus is on the analysis of results and the planning on how to make the company more productive and create value for its shareholders. SAP Philippines believes greatly in the potential of small and medium-sized businesses in the country, propped up by a strong and resilient economy and a highly literate and hardworking workforce. In fact, SAP Philippines expects revenue contribution from SMEs as a percentage of total revenues to steadily rise from 20 percent in 2008 onward with every year. SAP Philippines believes in providing all support work so that a company’s executives and staff will be able to channel their time and energy to productive and strategic concerns. Indeed, the emerging entrepreneurs of the Philippines, not to mention the bug businesses that traditionally require such support requirements as provided by SAP Philippines, are becoming very aggressive in finding ways to enhance their productivity and business intelligence capability.